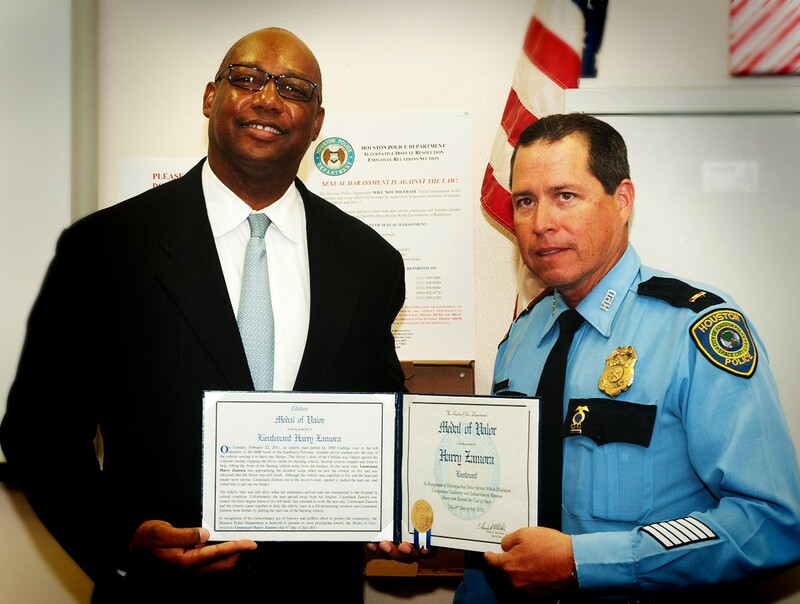 Houston Police Chief Charles A. McClelland, Jr. proudly presented HPD Lieutenant Harry Zamora with the Medal of Valor Award at a ceremony today (July 6) at the Fondren Police Station. 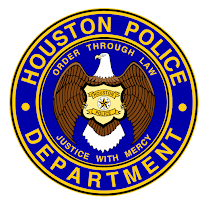 On February 22, Lieutenant Zamora saw an elderly man trapped in a Cadillac engulfed in flames on the inside shoulder of the Southwest Freeway. Several citizens braved the flames in order to lift the vehicle away from the guard rail so Lieutenant Zamora could open the door and free the man. Lieutenant Zamora suffered third degree burns to his hand in the process. It was those actions which prompted Chief McClelland to present Lieutenant Zamora with the department’s most prestigious award. “I’ve known Lieutenant Zamora for a long time,” said HPD Chief McClelland. “He has always been a dedicated professional and a dedicated police officer,” he said. “Heroes always think of themselves last and clearly Lieutenant Zamora’s actions fall into that category. 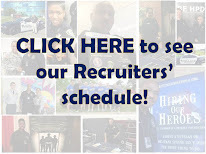 However, they go to the heart and soul of what HPD is all about,” Chief McClelland added. “All I remember is seeing the vehicle completely engulfed in flames. There were pieces flying off and it was exploding,” said Lieutenant Zamora. “The heat was so intense, I knew I was going to get burned, I just didn’t know how badly I was going to get burned,” he added. Lieutenant Zamora’s actions were much appreciated by Mr. Sanchez’s daughter. “April told me she was thankful we were able to get her father out of the car and get him to the hospital so she had time to make the trip from Dallas and say goodbye,” said Lieutenant Zamora.